Whales are having fun while developing fine motor coordination skills! This year the preschoolers will be working in a fine motor booklet especially designed for them. Before starting, they will put hands on different activities with concrete material such as tweezers, beans, nuts and bolts, beads, etc. 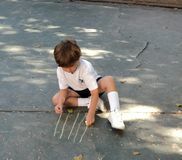 The children in the Whales classroom had fun drawing lines from top to bottom. They went to the playground right behind the Little House and they were all given a coloured chalk to start drawing. Many walked on the lines they had drawn, trying not to fall. They were so happy! Some drew long lines and others short ones; each very proud of their productions. After practising this skill, they were given the time to draw freely. They had great fun and enjoyed the activity!